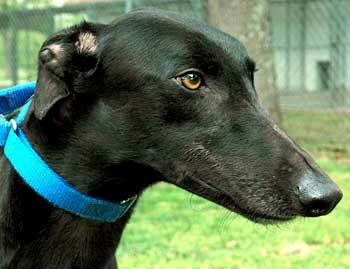 Rod, aka CTW Hot Stuff, is a very handsome 3-year-old black male, born May 23, 2002. His sire is Greys Statesman and his dam is Ramie, and he is a sibling to Hot Rod. Rod's racing career consists of 59 races, starting November 22, 2003 at the Corpus Christi, Texas race track, and while he was there he was a AA racer. 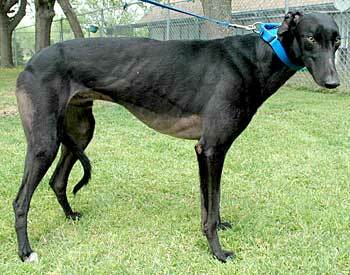 He moved to Gulf Greyhound Park in La Marque, Texas, on September 9, 2004 and stayed there until October 30. His last race was at Valley Race Park in Harlingen on January 5, 2005. Rod tested in the moderately low carrier level of von Willebrand's. His neuter and dental surgery was performed by Preston Park Animal Hospital and there were no problems or indications of any. Rod appears to be small animal and cat tolerant. Rod is, we have to say it, the perfect dog. Sweet, gentle, HAPPY, and downright lovable describes this boy! He is a keeper - how can you not love that face? The pictures do not do him justice - you have to see him in person to appreciate his gorgeous coat and Lab eyes. He loves toys and is developing the ability to fetch. He is always right behind you to inspect what it is that you are doing - ears up and head cocked to the side with curiosity. Nap time is taken seriously and if you ask him to lay down, he will do so. He is currently living with our male grey and female mutt (the queen bee) and two cats (which he has since lost interest in after a week). He responds immediately to "no" and is quickly becoming a well-behaved member of the house. He crates well during the day and is learning that "outside" means it's time to take care of business and that "inside" means that "mom" is tired of waiting for him to finish his business. He is curious about objects in the house - books and other dust collectors that are easily picked up but a firm 'no' and refocusing him on his toys has kept those urges in check. If the ears and eyes, don't get you - the abundant kisses should finish you off.